Wide range 802.11ac dual band USB wireless adapter AWUS1900 brings extreme distances and with blazing speed to your Mac or Windows computers in your WiFi network. Up to 600Mbps in 802.11n mode and up to 1300Mbps in 802.11ac mode, AWUS1900 connects to your PC with USB 3.0 with AC1900 Wi-Fi technology to provide super performance. 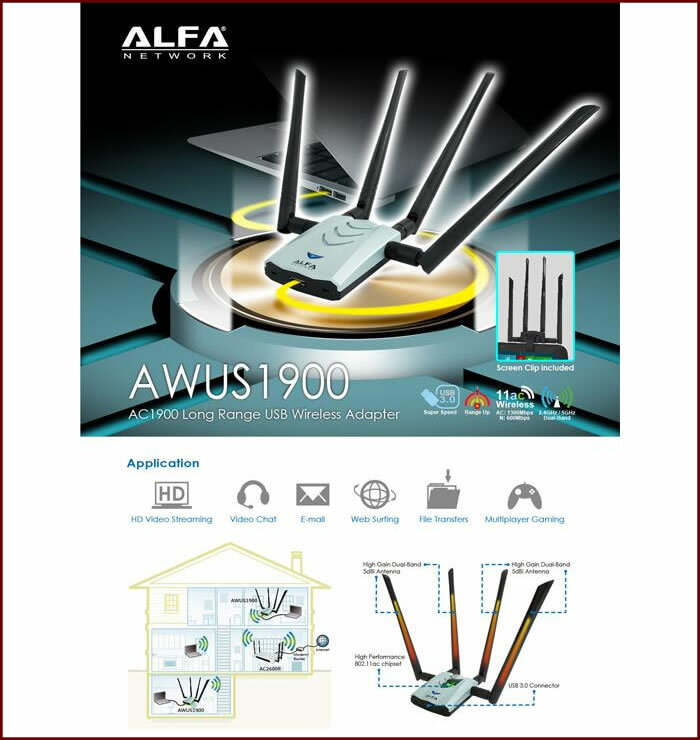 Inheriting years of experiences in wireless industry, ALFA AWUS1900 is built with latest 802.11ac standards, plus high-sensitivity dual band antennas, resulting in extraordinary signal strength and coverage. No more signal dead zone in your living space when streaming HD video, downloading large files or surfing on the web. The ALFA AWUS1900 has four external antenna connectors (RP-SMA) with two detachable WiFi dual band antennas which can be simply replaced by dual band WiFi antennas of your choice. We offer various kinds of WiFi antenna which can be combined with this high gain WiFi USB adapter.